Few people have bothered to defend the Majoritarian, winner take all character of the current Canadian electoral system. This parliamentary system has been in existence in the same form since the founding of the modern state in 1867. In these remarks, I offer a defense of Majoritarianism in the Canadian context when the alternative is some form of Proportional Representation. 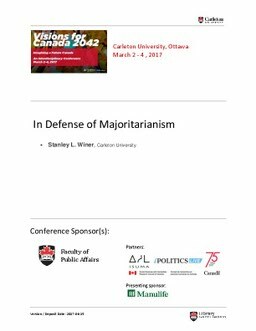 These remarks were prepared as an opening statement in a debate on electoral reform at a Faculty of Public Affairs 75th Anniversary conference at Carleton University, March 3, 2017. The debate arose because of the Prime Minister's announced intention to replace the current system with some other during the election campaign that led to his victory in 2015. The debate occurred a few months after the release of a lengthy report on electoral reform by a special allparty committee of the House of Commons. A few weeks before the debate, the Prime Minister announced (independently of the debate, of course) that his government would no longer pursue electoral reform, perhaps because it looked like he would not be able to avoid a referendum, a process which is hard to control. In any event, and especially in the light of recent attempts to change the system both at the federal level and in some provinces, I think it is important for people to understand that the existing electoral system is a sensible one that likely will continue to serve us well. Winer, S. (2017). In Defense of Majoritarianism. Presented at the Visions for Canada 2042: Imagining a Future Canada, Faculty of Public Affairs.